On June 21st, 2015, three oikos members traveled to New York City with a bag full of aspirations and enthousiasm. Anita Negri, Julia Weber (oikos Vienna, COMMIT Manager) and Nikolay Ivanov (oikos Copenhagen, CBS PRME), first attended the GRLI Annual Meeting (June 21st and 22nd). On the first day of the GRLI AGM, the oikos team met with Chris Taylor, the so-called, mentor of COMMIT. Chris has been involved in GRLI for a long time and is the key link in the cooperation between oikos and GRLI for COMMIT. He is also a a consultant at the Oasis School. This meeting served to revise and complete last-minute details for the workshop that the team would host on the second day of the GRLI AGM. After an interesting introduction, a magnificent dinner was held next to the World Trade Center. Over dinner several interesting conversations were held which brought multiple perspectives together on how to advance cooperation between business and universities and how the educational systems around the world vary. The interest in COMMIT rose as well, as the vast presence of faculty was interested in understanding how we can truly make a step forward to achieving more responsible management education. On the second day of the GRLI AGM, the COMMIT workshop was amongst the many workshops which were proposed. The workshop focused on asking challenging questions to the participants and making them realize the pressing need to change management education and our methodologies. With the use of several innovative methods, amongst which the collaboratory, the COMMIT workshop was named a success. The outcomes included commitments from professors and deans which will be soon published and an overall increase in awareness and understanding of the possibilities to further explore alternatives in teaching. The GRLI AGM closed with another magnificent dinner where like-minded people continued making plans and commitments to improve current educational systems. On June 23rd the PRME Global Forum started. 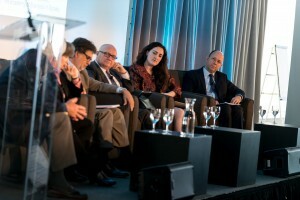 After the opening speeches, the first panel discussion took place. This panel also featured the oikos President, Anita Negri. By bringing a youth perspective on the need to change management education, Anita pointed out several points that she gathered throughout her work within, and outside, oikos. She highlighted the need for more collaboration, a true integration of sustainability and responsibility in all courses, an improvement in skills and values directed at students and more. Her interventions were very well received and sparked interesting discussions in the round tables that followed. The first day was continued with another panel discussion and parallel workshops where participants got in touch with best practices and started new partnerships and projects. The second day featured another workshop hosted by oikos and COMMIT: the student perspectives workshop. The organisers were delighted to see a full room for this workshop where, not only oikos and COMMIT were presented, but also student organizations from New Zealand, Brazil and Canada displayed their achievements and goals. Throughout the session groups were formed to discuss three topics: what changes are required in curricula, what changes are required in teaching and what changes are required in universities. Each team chose their preferred topic and each team was requested to present their findings in a creative manner. The session also featured some dancing to convey the message that education should include more fun! The PRME Global Forum was concluded with a closing ceremony, a lot of smiles, achievements and positive outlooks for the future. On behalf of the oikos community, we would like to thank GRLI and PRME for having given us the opportunity to participate to these events and contribute with our youth perspectives. Join all these creative and pro-active minds in changing education, we can do this! Some more insights on the conferences can be found on Anita’s twitter account.